​Like many sailors in love head over heels with the Aeolian, I always considered the Egadi island as the lesser cousin, as an english peer would consider his second son. I was wrong. Even the Sicilians cannot mess things up so badly to spoil this place and a cruise to Favignana and Marettimo stands high in the list of places to go. Here you can also taste good Mediterranean cuisine. The archipelago of the Egadi is located at the western end of Sicily, a few miles from Trapani, and is made up of the islands of Favignana, Levanzo and Maritime, 'Formica" islet and the rock of Maraone. These islands set in beautiful crystal clear waters, offer the visitor with a series of stunning bays, natural pools perfect for swimming and snorkeling and traditional fishing villages where the time seems to stand still, these islands are able to rediscover the visitor smells and flavors that seemed forgotten. However, there are also cultural attractions: the former Florio, the largest maritime museum in Europe (Favignana), to the Grotta del Genovese (Levanzo), the largest complex of parietal figures of our country, dating back to paleolitico- Neolithic. 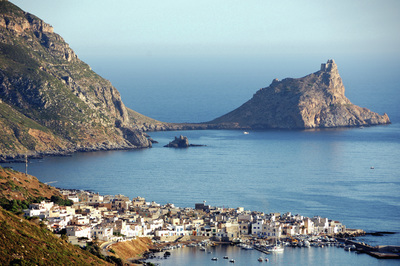 For those who like a pinch mountain, Marettimo offers hiking trails. There are also numerous excursions to the Egadi suitable for everyone: the visit of the underground gardens (Favignana), climbing donkey atop Mount St. Catherine (Favignana), and much more. Aegadian will no doubt be able to rediscover the visitor the pleasure of simple things and of nature, sometimes leaving you breathless with their beauty. In order to preserve the natural beauty of the archipelago, it has recently established the Marine Protected Area Aegadian, the largest marine reserve in Europe. This unfortunately if appreciable one hand but creates many problems in terms of permits to those who choose to visit the islands by boat. Check at 5:30 p.m. at the small port of Marsala, briefing on the itinerary of the week. For those who have chosen to have only the skipper, you can arrive at embarkation with the galley already made and consequently set sail immediately after check-in for a nearby roadstead or you can provide the galley after check-in, in this case the overnight stay is expected in port. 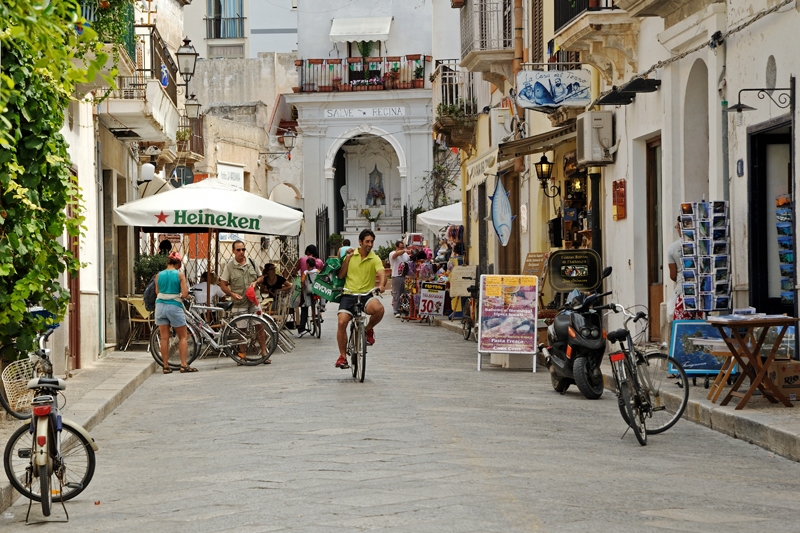 You can decide whether to dine out in the characteristic center of Marsala or on board. 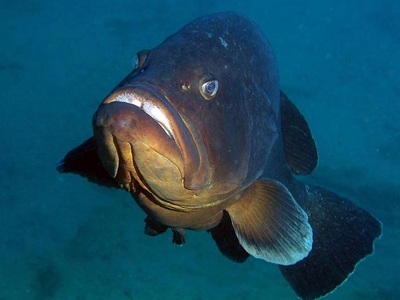 Favignana A little over 1 hour from Marsala we will find one of the most beautiful bays of the island, where in total relaxation we can immerse ourselves in crystal clear water, of a dazzling blue and by snorkeling it will be easy to meet and admire different types of fish. It is the largest island of the Egadi Islands and also the most inhabited. The island has a characteristic butterfly shape, is quite barren and hosts the typical Mediterranean vegetation. 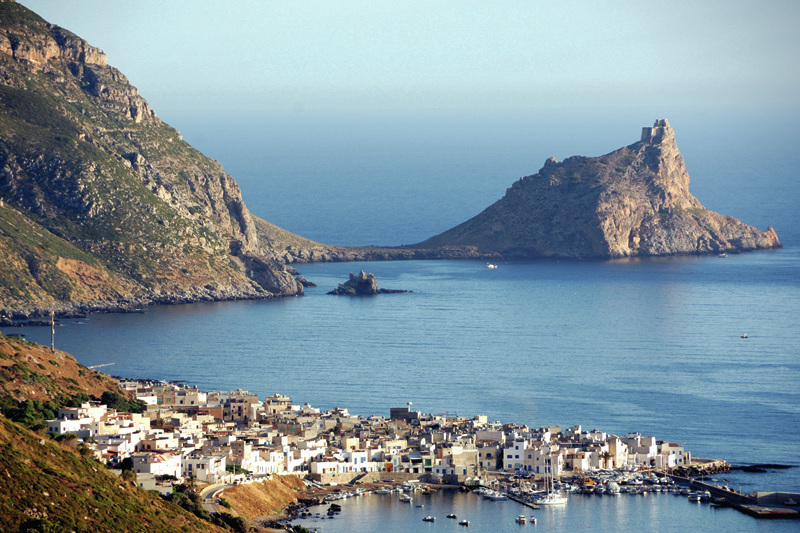 The town of Favignana is a delightful port of call, its cafes, its cobbled streets, the Piazza della Chiesa, the district of Sant’Anna dating back to 1600, testify to the ancient riches of the island. Until recently, one of the most impressive "tonnare" of Mediterranean was active here. Belonged to the Florio family, rich Sicilian merchants, the factory has long been the focal point of the economy of the entire archipelago. Palazzo Florio, located on the top of the highest mountain, was built in 1878 thanks to the idea of ​​Damiani Almeyda, one of the most esteemed architects of the time. At the moment it houses a museum containing archaeological finds recovered from the archipelago's seabed. The summit of the mountain also offers a breathtaking view, from there you can admire the entire island and the sea that surrounds it. The Hypogeum Gardens certainly deserve a visit: they are tuff quarries that enclose a pretty natural oasis, this thanks to the work of the peasants of the past, who worked to cultivate it with plants and trees. 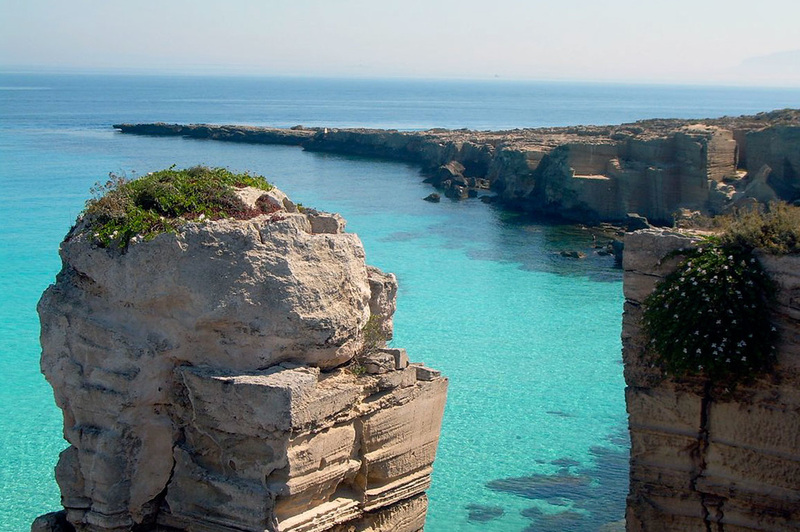 The most authentic quarries of the island are found, instead, in the north-eastern part: these, in addition to the already mentioned tonnare, represented one of the first economic resources of Favignana. Favignana has a single port, Cala Principale, whose entrance is very characteristic being this bordered by an old tonnara that descends into the water. We will also see the castle that with its lights in the evening will act as a suggestive backdrop. In the afternoon we will visit other famous coves, Cala Rossa, Cala Azzurra, Cala Rotonda and the Bue Marino, to then spend a pleasant evening in the harbor, under a wonderful starry sky. Morning dedicated to sun and relaxation, lunch on board. 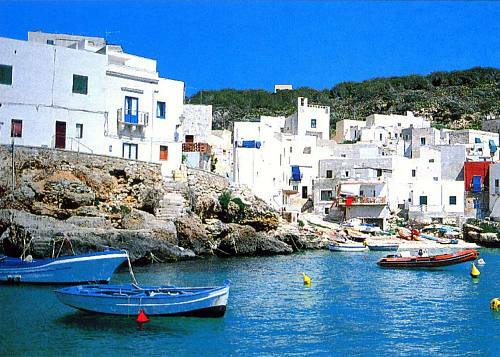 In the afternoon, you can be dedicated to visiting the characteristic village of Favignana. You can take a guided tour of Florio's museum, once the nerve center of the entire island. Here 900 people worked for the construction of the Tonnara, an ancient tuna fishing method. Later we will set sail for Levanzo, only half an hour of navigation and we will find ourselves in an incredible context: a turquoise sea of ​​extraordinary beauty, a place where time seems to stand still. A wonderful island, the smallest and wildest of the Egadi Islands. Levanzo is composed of white limestone rocks in which there are numerous caves. The Greek name of the island was Phorbantia, probably a cause of the abundant amount of grass in the island. The country consists of a small group of houses with a small marina, Cala Dogana. The true pearl of Levanzo is Cala Tramontana, which will give your eyes a show that you will hardly forget: the colors of rock and water will strike you more than any painting. It hasn't roads, only a small paved road that leads to the Faraglione beach. This condition of technological backwardness explains the integrity of its scenic beauty. We will be able to have breakfast on board but going down to the ground, you can find Sicilian granitas, ice creams and home-made desserts that will surely surprise you. Walking along the paths of Levanzo, we will be able to visit a large cave, the "grotta del Genovese", where inside you can admire prehistoric depictions, engravings and paintings describing human and animal figures from the Paleolithic and Neolithic periods. Once back on board, we will sail around the island, admiring the most beautiful coves like Cala Fredda, the Faraglioni and Cala Minnola where you will have the opportunity to swim having the impression of being surrounded by vegetation, since it reflects perfectly on the mirror of water. Levanzo, the smallest of the three islands, has a wild soul: no asphalt road, very few houses that in any case are very small and all painted white. 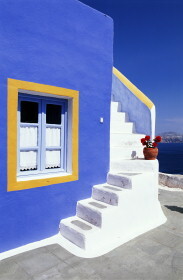 We will leave for Marettimo, the most distant and unspoiled island. Its main features are the over 800 caves, its beautiful hiking trails, surrounded by greenery and with a huge variety of endemic plants. 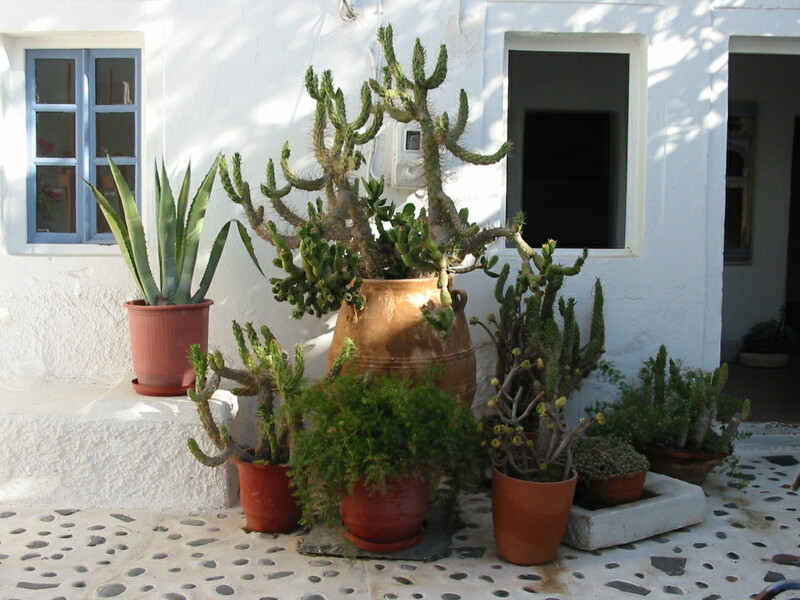 Located just a dozen miles off the coast of Favignana, Marettimo is the westernmost island of the Egadi Islands and also the wildest, with a very precious vegetative and faunal heritage, where rare species almost unique to the Mediterranean have managed to survive. Marettimo is very tall and dark, it descends into the sea with arid and steep slopes that end with rocky coasts in which numerous caves both open and submerged open up, a true pride of the island. Among the most beautiful caves is that of the Thunder or of the Nativity, famous for its stalactites and stalagmites. 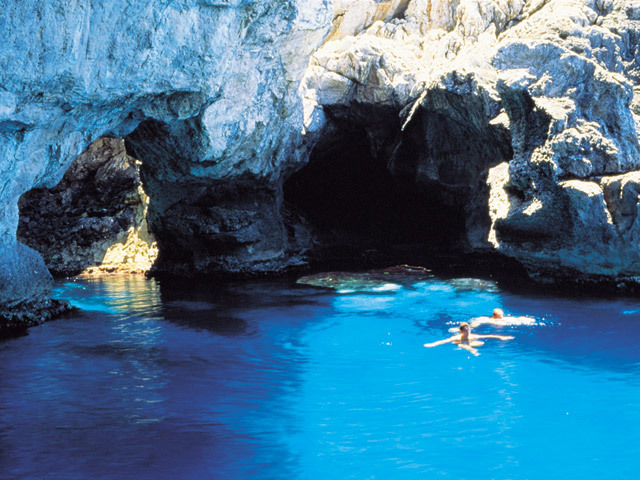 Marettimo also offers wonderful experiences for scuba diving enthusiasts, such as the wreckage of a merchant ship, a 30-m deep cave dive, and the immersion in the Secca del Cammello. Another asset of the island is the absolute tranquility that inspires its visitors. Peace is guaranteed by the small number of inhabitants who live grouped in small sympathic centers. For lunch we head under the castle of Marettimo, now a monk seal observatory. In the afternoon, we will enter the port, and will go ashore to visit the characteristic alleys of the center. 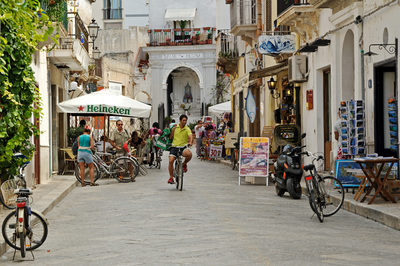 Marettimo is famous for its excellent food and delicious local wines. Also worthy of note for a visit is the Byzantine church, which presents an architecture of oriental appeal, the archaeological site dating back to the Roman period called the "Roman houses" and whose building had a defensive purpose, the castle located on Mount Falcone, from which you will be able to admire both the marvelous architecture of the fortress and, turning your gaze to the horizon, an amazing panorama. In the morning, we will be accompanied by local fishermen with small boats in the reserve area of category A reserve area. This area, which is reserved for them only, allows you to admire the caves, the marble quarries and with a little luck, we will encounter dolphins and seals nuns. In the afternoon we will sail on the way back to arrive in Marsala. Check out at 9:00 a.m. The itinerary shown is subject to variations based on weather and sea conditions. For security reasons, the judgment of the skipper regarding navigation and any changes to the program is final.